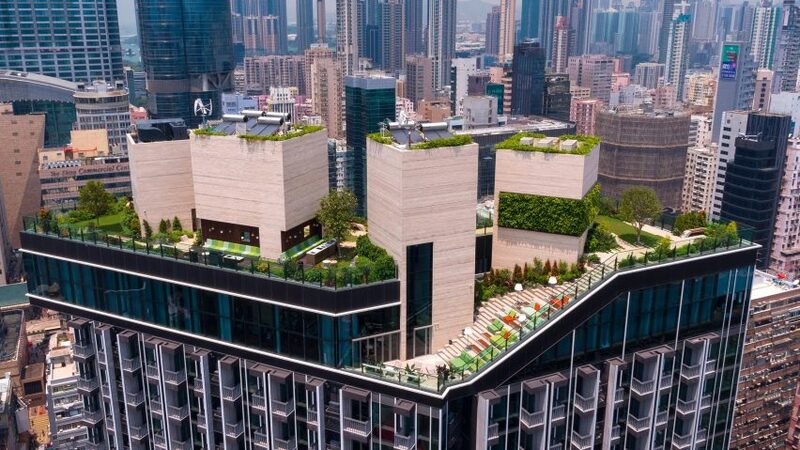 Dezeen promotion: entrepreneur Adrian Cheng has worked alongside Dutch architecture studio Concrete to create a new social space in Hong Kong tower Skypark that meets the needs of its youthful residents. 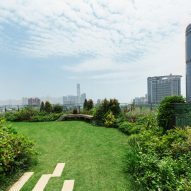 Located in central Kowloon, Skypark features a clubhouse and lawned garden on its roof, with exterior steps that double as amphitheatre-style outdoor seating. 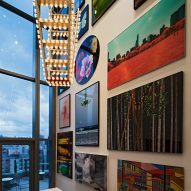 New World Development built the rooftop in line with a lifestyle concept it calls The Artisanal Movement, which foregrounds the experience of creativity, craftsmanship and community. 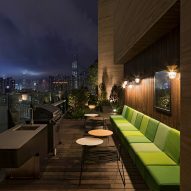 It wanted the Skypark rooftop to feel like an escape from the city, and provide the mostly young professional residents of the building a place to come together, relax and socialise. 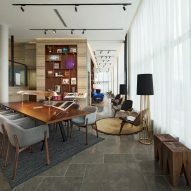 "The architect has created a space perfect for urban dwellers, especially for balance-centric millennials, realising their dream of longing for a serene space where they can escape the hustle in the midst of the bustling city life," said New World Development. 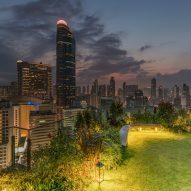 "The end result is a green clubhouse in the sky and a park high above the city, where people can interact with each other easier than ever, in a space without boundaries that provides inspiration for all." 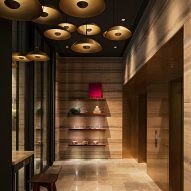 Located on the 28th floor of the building, the clubhouse is called The Aurora. 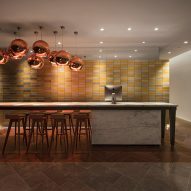 Its facilities include an indoor swimming pool, a poolside bar, a library and a gym. 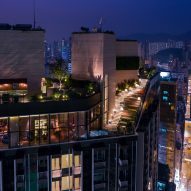 The clubhouse is entirely wrapped in glazing, allowing views over the rooftops of Kowloon. "It breaks the traditional clubhouse design mould, and provides an open and revolutionary space," said Concrete. Linking the clubhouse with the rooftop garden on top of it, called The Lawn, is a set of large exterior steps known as Sky Stairs. Vibrant cushions top the wider portions of the steps, creating another casual outdoor seating area, loosely inspired by the stairs outside New York's Metropolitan Museum of Art. The Lawn is the work of garden designer Adrian L Norman. It is laid out in a series of smaller gardens and nooks, allowing groups of various size to settle in a spot that suits them for activities like picnics and barbecues. Renewable energies were incorporated into the building of Skypark's rooftop facilities, with wind turbines used to power some of the lighting, and solar power used to heat the clubhouse showers. Recycled rainwater is used for rooftop irrigation. New World Development is led by Adrian Cheng, who serves as executive vice-chairman, and is also active as an entrepreneur and patron of the arts in China and Hong Kong. 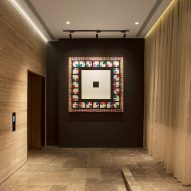 The founder of the K11 "art mall" and the K11 Art Foundation, he also dabbles in design, and displayed a furniture collection created with Shigeru Uchida at this year's Milan design week. The Skypark tower is located on Nelson Street in Mongkok, Kowloon. Completed in March of this year, it contains mainly studio and one-bedroom apartments, in keeping with its focus on the millennial market. For more information, see the New World Development website.